Usually it's the one you suspect the least that's behind the most masterful plans. Looks like we've finally figured out who's behind all those diving birds ... You're little one will love being the mastermind in this Angry Birds King Pig Bunting. Stolen eggs is becoming a major problem in society and those nasty little green piggies just won't stop their evil behaviors. Don't worry though. All it takes to teach them a lesson is a little moxy and some style from the Angry Birds video game. Just send your little girl to the pig fortress wearing a Red Bird dress and those pigs will know the score. She may be cute, but she's got good aim. Bring your favorite video game to life with this Angry Birds Tween Yellow Bird Costume. And be vigilantly ready to attack any green pigs. Each chick has different strengths and weaknesses. Sure, Chuck here is great at breaking wood, but not so great w/ glass. However, he's got great aim and is always a team player. Get your little chickie all bundled up and ready to destroy some piggies in this Angry Birds Yellow Bird Bunting. 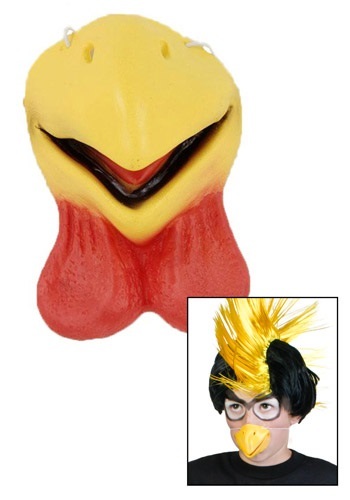 You'll be an angry bird without this Bird Beak Nose. The piggies are closing in, quick throw on your beak, wig, and costume t-shirt. You're needed STAT! Take the plunge this year with a Black and Yellow Mohawk Wig. It's a great way to gauge your friends love (or hate) of a rocking Mohawk! Accelerating through space? Please. You've got this. Pop those pigs out of their space bubbles with this Child Lazer Bird Costume! There's a few things you shouldn't do around birds ... Mainly, try to steal from their nest. This little bird is sure to protect his candy-filled nest in this Toddler Black Grumpy Bird Costume.